IN-FORM Combined Counties Football League – Division One club Sheerwater are on course for their best ever season, writes Andy Fitzsimons. Yet, despite chasing their tenth consecutive league match unbeaten this Saturday (14 Oct), The Sheers face the absurd prospect of achieving a top-six finish, but still being relegated next April. Woking Borough Council’s (WBC) proposal to relocate the club from their Recreation Ground in the village to a new purpose-built facility on a green-field site behind Bishop David Brown School has not materialised. And with no site rubbed-stamped for development any time soon, the net is closing in on Pete Ruggles’ side, whose current home does not comply with The Football Association’s new national ground grading requirements. All clubs currently competing at step 6 of the National League System, which includes Sheerwater, will be required to have at least a G-grade ground grading by 31 March 2018 to satisfy the FA inspectorate. But with no firm plans in place to erect floodlights at the Recreation Ground, which is also home to Woking Athletic Club; and with no viable option for Sheerwater to groundshare at Woking FC, Westfield FC or Knaphill FC this season (2017-18), the immediate future is not looking bright for The Sheers. 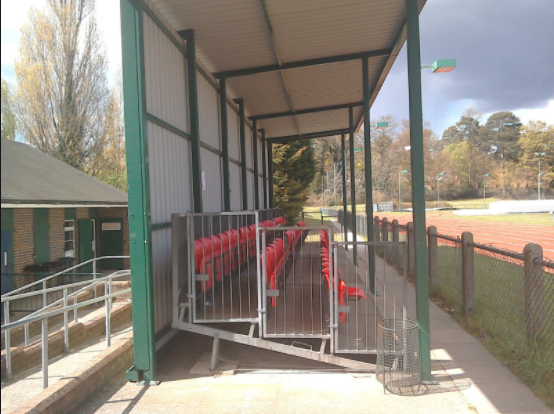 A spokesperson for Woking Borough Council said: “While there is no legal obligation for the Council to re-house the football club in a suitable venue, we are determined for Sheerwater to remain playing competitive football within the league structure (National League System). “The Council has agreed that the wider Sheerwater Regeneration Project will go ahead; this includes plans for state-of-the-art leisure facilities, which includes a provision for Sheerwater FC. “The Council is, therefore, making strong representation to The FA regarding the (end of March) cut-off date, bearing in mind the planned superior (leisure) facility. In response, a spokesperson from The FA said: “Every club operating at step 6 [of the National League System] needs to fully adhere to the G-grade ground criteria by 31 March 2018. “If there are specific individual cases, then a club would have to write to the Ground Grading Technical Panel and enter as much detail as possible for them to make a decision as to whether dispensation would be permitted. “Clubs have known about the requirements to meet the new grade for three years, so it would have to be a pretty robust case,” they added. The FA further emphasised that floodlight pylons should be fixed, not removable fixtures to satisfy the Association’s grading requirements. Although, close neighbours Woking proved otherwise when they used two cherry pickers to house some of their floodlights during the erection of their infamous Leslie Gosden stand in 1995. The Woking News & Mail understands that the assigned FA panel has not received any correspondence from Sheerwater FC or Council representatives to date. The Sheers, however, are certainly not alone. Prior to the commencement of the 2017-18 season, only 47% of all clubs competing at Step 6 leagues across the country reportedly met the Grade G requirements in full.